Department of Anatomy, Yenepoya Medical College and Hospital, Mangalore-575018, Karnataka, INDIA. School of Computational and Integrative Sciences, Jawaharlal Nehru University, New Delhi – 110067, INDIA. Department of Applied Zoology, Mangalore University, Mangalagangothri-574199, Mangalore, Karnataka, INDIA. Myocardial infarction (MI) is a multifactorial and polygenic cardiovascular disease with high mortality rate. Early diagnosis could help in precautionary measures and change in life style. Many studies used dermatoglyphics as noninvasive technique to predict the incidence of genetic diseases. Here, we tried to assess the association of dermatoglyphic pattern between MI and controls. We investigated dermatoglyphic patterns among 800 participants (n=400 MI cases and n=400 control groups) representing South Indian population. Patients with MI were compared with control groups who did not have any history of MI. Showed higher frequency whorls in MI patients and loops in control group (p<0.001). The study showed significant difference in distribution of whorl (OR = 0.298, 95%CI=0.223-0.399, p=0.0001), loop (OR = 3.537, 95%CI=2.639-4.741, p=0.0001), arch (OR = 0.545, 95%CI=0.405-0.733, p=0.0001). Further, mean values of A-B ridge count (OR = 1.421, 95%CI=1.167-1.731, P=0.0001) of MI and control groups were significant (p<0.05). The present study showed that there is an association between dermatoglyphic patterns and MI cases. Further, findings suggest that dermatoglyphic patterns may contribute to etiology of early prediction of MI. Myocardial infarction (MI) is a multifactorial, polygenic disorder that accounts for the leading cause of death in developing and developed countries. The data indicates that younger generations are more affected, where 10% of MI patients are under the age of 45 years.1 Inspite of changing lifestyle, food habits and intervention of pharmalogic approaches, MI still continues to be a principal cause of death in many countries.2,3 Even though the biomarkers4-6 and genetic basis 7,8,9 for MI is comprehensively studied, still the precise underlying genetic cause remains controversial.10 Dermatoglyphic features have been associated with numerous medical disorders.11,12 Since many decades these associations have generated considerable interest in clinical medicine in light of their potential for providing inexpensive and non-invasive screening methods for certain diseases as well as an insight the etiology of the disease. As an important phenotype, dermatoglyphic may play a fundamental role in the medical field in identifying the diseases. Dermatoglyphic can be defined as the structural arrangement of the ridge patterns on the finger tips and palms which are genetically controlled and are dependent on prenatal environment.13 The dermatoglyphic patterns start to develop between 5th and 6th week of development and are completed by 21st week of intrauterine life.14 Both heart and the fingerprint develop in the first trimester of intra uterine life of the embryo. Although the fingerprint development completes at the beginning of the first week of 2nd trimester15 (when the heart is already formed), the primordium of ridge lines and volar pads are present earlier. Therefore, we hypothesize that factors arising in the first and second trimesters of pregnancy which affect the development of the heart may also influence the development of ridge patterns of the palm and finger tips. Basically, there are three fingerprint patterns - loops, arches and whorls.16 According to Kuklin et al., (2001), these patterns are determined by the genes. The gene for whorl is located in chromosomes 13 to 15; arch in the chromosome 17 and 18 and loops in chromosome 21.17 Significant outcome were obtained in the study of dermatoglyphic patterns in Down’s syndrome, Turner’s syndrome, Klinefelter’s syndrome, congenital heart disease, leukemia, breast cancer, celiac disease, intestinal disorders, rheumatoid arthritis, diabetes mellitus, bronchial asthma, Alzheimer’s disease, schizophrenia and other forms of mental illness.18-27 Furthermore, dermatoglyphic was studied to predict congenital anomalies like cleft lip, cleft palate and ectodermal dysplasia.28,29,30 In addition, some reports have correlated dermatoglyphics with occurrence of myocardial infarction (MI) in the Japanese and Caucasian populations.12,31 Anderson et al., (1981), hypothesized that some genetic or environmental factors might interfere with the orderly development of both the heart and the volar pads which is reflected in the dermal ridge arrangement.12 Rashad et al., (1978), have published the preliminary results of a study in Japanese males with MI showing significant correlation of the disease with dermatoglyphics pattern compared to control groups.32 However, there is no literature on dermatoglyphics linked to heart diseases in the Indian population. Hence, the aim of this study was to test the hypothesis of association between dermatoglyphics and MI in South Indian population. Further, present findings were compared with the study involving Japanese and Caucasian population. The present study comprised of 400 patients with acute MI and 400 age and ethnically matched healthy controls with no history of MI from South India. Most of the cases group (82%; 328/400, n = 328) had MI for the first time and late onset (age 58.2 ± 10.3 years). The finger and palm prints were collected from in patients at K S Hegde Medical College Hospital and Yenepoya Medical College Hospital at Mangalore, India. The MI was diagnosed by a panel of interventional cardiologists and cardiothoracic surgeons based on the ECG (electrocardiographic) changes, increase in serum creatine phosphokinase, aspartate aminotransferase and troponin T. Patients (1) who underwent CABG (coronary artery bypass graft) after MI, (2) with angiographically proved coronary artery disease after MI and (3) with acute coronary syndrome were included in the present study. Patients with (1) recent injury or fracture of hand, (2) permanent large sized scars and any congenital deformities of hand and (3) cardiomyopathy, thrombolytic disorder, congenital heart disease and myocarditis due to bacterial or viral infections were excluded from the study. Control individuals were ethnically matched, free from MI and without history of hypertension and diabetes as determined by the clinical examination and medical history. In addition, the subjects with family background of MI were not included in the control group. The study protocol was reviewed and approved by the Yenepoya University Ethics Committee, Yenepoya University (YUEC160/18/8/2015), and Central Ethics Committee, Nitte University (NU/CEC/2015/014), Deralakatte, Mangalore, India. Prior to the sampling, the purpose and technical details of the study were explained to the study participants both the controls and patients. An informed written consent was taken from every participant. The finger print was collected by ink and paper method.33 A magnification lens was used to count the ridges. All the observations and ridge counting were done by a single observer to prevent the inter-observer errors. All the observations were repeated twice on the different days, results were compared, and the average was taken. Dermatoglyphic traits were defined and quantified according to the standard methods.33 The study included quantative dermatoglyphic variables such as finger ridge count (FRC), the radial and ulnar ridge count (RRC and URC of ten fingers), measurement of ATD angle and A-B ridge count (Figure 1). Similarly, qualitative variables such as the pattern types, classified as loop (ulnar loop and radial loop), whorls, arches (plain arch and tented arch) and composites (lateral pocket loop and twined loop together called as double whorl) were included (Figure 2). The finger ridge counting was done only for loops (ulnar loop and radial loop). In the finger print bureau, the whorls were taken for ridge tracing not for ridge counting. Further, process of ridge counting is not used for arch pattern because there is no delta and core. However, in the present study only loop pattern for ridge counting because it is a considered as a well-represented pattern, as 60% percentage of finger patterns belongs to loop category and well demarcated core and delta is clearly visible in the loop pattern. The basic finger print pattern: from left to right - arch, loop and whorl. The ridge counting was done by drawing lines that connect the core of the finger print patterns to delta (triradius). There is lack of triradius to arch. Statistical analysis was carried out using the SPSS (version 21) package. Dermatoglyphic features and combinations thereof were evaluated by standard statistical tests (chi-square, independent ‘t’ test) for their performance as predictors of risk for MI. Chi-Square tests was done to manifest the association between MI and control group and independent ‘t’ test was used for quantitative analysis. The Odds ratio (OR) with 95% confidence intervals was also calculated. The differences were considered significant if the p<0.05. The mean age of healthy controls was 60.1 ± 9.2 years while that of patients was 58.2 ± 10.3 years. There frequency of tobacco chewers was higher in the MI cases (70%) as compared to the control (20%) (Table 1). In the overall sampling of the population, the scores for the most common type of fingerprint pattern in the MI group (n = 400) were whorls (50%), followed by loop (44.3%). However, in controls loop (59.8%) patterns were more followed by whorl (35.5%) (Table 2). The frequency of arches was less in both MI (5.8%) and controls (4.7%) groups. Therefore, the overall summary of the distribution of finger print pattern in MI and control were significantly different (p<0.001). The cardinal feature of the distribution of fingerprint pattern in MI was whorl (50%) > loop (44.3%) > arch (5.8%) and in control loop (59.8%) > whorl (35.5%) > arch (4.7%). Demographic details of cases and controls. MI - myocardial infarction, SD - Standard deviation, NA - not available. *Hypertension and diabetic patients was an exclusion criterion for control group. n (%) - frequency (percentage within group). Comparison of finger print pattern of cases and control groups. MI - myocardial infarction, W - whorl, L – loop, A- arch, SW - single whorl, DW - double whorl, UL - ulnar loop, RL - radial loop, PA - plain arch, TA - tented arch, n - total number of digits of both hands in MI and control, n (%) - frequency (percentage within group). Chi square test was used to compare the MI and control groups. Level of significance: p<0.05 was considered significant. *p<0.05. Further, comparison of the distribution of finger print pattern in individual digits of both hands between MI and controls showed significant difference in the distribution of fingerprint pattern in all the digits (p<0.05) except the arch pattern of thumb and ring fingers of both the hands, and the loop pattern of left hand thumb finger (p>0.05) (Table 3).The higher frequency of whorls in MI was seen in all digits of both hands. Similarly, in controls higher frequency of loops was seen in all the digits except in the thumb of left hand (Table 3). Digit wise comparison of fingerprint pattern distribution of the two hands between the cases and control groups. MI – myocardial infarction, FP – finger print, W – whorl, L – loop, A – arch, n – total number of each digits of right hand and left hands in cases and control respectively. 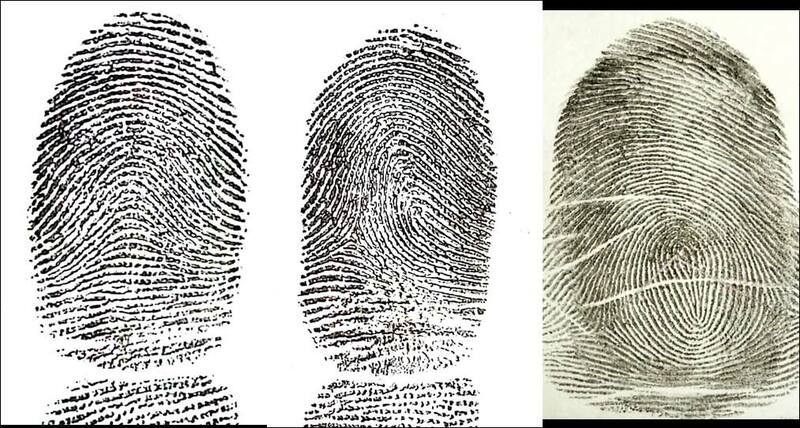 Chi square test was used to compare distribution of finger print pattern of in each digit of two hands between cases and control group. Level of significance: p < 0.05 was considered significant. *p < 0.05. The OR (odd ratio) was used to determine the risk of developing MI in an individual. The estimated risk for the MI cases and control group were whorl (OR =0.298, 95% CI = 0.223 – 0.399, p=0.0001), loop (OR =3.537, 95% CI = 2.639 – 4.741, p=0.0001) and arch (OR =0.545, 95% CI =0.405 – 0.733, p=0.0001). The odds ratio suggests that in the control there was more number of <4 whorl pattern and <1 arch pattern, whereas in there was more number of <5 loop pattern. Therefore, an individual with whorl pattern in 4 or more fingers, loop pattern in less than 5 fingers and arch pattern in more than 1 finger might be a risk for developing MI (Table 4). The finger ridge count, FRC (mean ± SD values) in every digit of both hands of MI patients and control groups were similar (Table 5). The FRC of the left-hand thumb, index, middle, ring and little fingers were statistically different (p<0.05) between the MI cases and control groups. However, we did not observe statistically difference (p>0.05) in FRC of the right-hand digits except in the thumb and little fingers (Table 5). If FRC is more than 13 in index (OR =0.571, 95% CI = 0.374 – 0.873, p=0.009), middle (OR = 0.458, 95%CI = 0.305 – 0.689, p=0.0001) and ring (OR = 0.568, 95%CI = 0.379 – 0.852, p=0.006) and less than 13 thumb (OR = 4.422, 95%CI = 2.291 – 8.535, p=0.0001) and little (OR = 1.479, 95%CI = 1.009 – 2.168, p=0.04) fingers of left hand might be the risk for MI. Estimated risk of fingerprint patterns among MI and controls. FP – finger print, MI – myocardial infarction, OR – Odds ratio, CI – class interval. 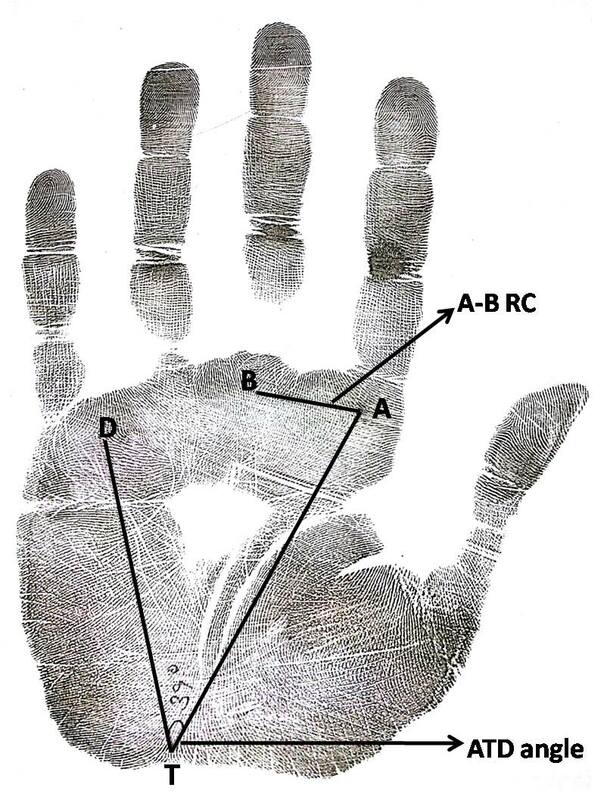 Numbers indicates median value of the finger print pattern and number of ulnar loop in digits between MI and controls. A-B RC – A to B ridge count. MI - Myocardial infarction, R - right hand, L - left hand, n - total number of loops of each hand in cases and control respectively. Student ‘t’ test was used to compare FRC between MI and control groups. FRC count is expressed in mean ± S D. p<0.05 was considered as statistically significant. *loops was used for ridge counting whereas whorls and arches were excluded. Further, we observed the ATD angle on both hands of the of MI patient and the control group, it was found that ATD angle was wider in left hand of MI patients than the control group, it was not significant (p>0.05). However, we also carried out the A-B ridge count and found mean A-B ridge count were significantly higher in control group (p<0.05) than MI group. In Odds ratio there was a clear association between A-B ridge count and MI patients (OR = 1.421, 95%CI = 1.167-1.731, p=0.001) (Table 6). It was found less than 38 A-B ridge count might be a risk for MI. RH- right hand, LH - left hand; n - total number cases and control. Student’s ‘t’ test was used to compare the ATD angle and A-B ridge count between MI and control groups. ATD angle is expressed in mean ± SD. p<0.05 was considered to be significant. ˚ - ATD was measured in degree. Earlier studies showed that the dermatoglyphics features were used to associate with clinical medicine and etiology of the various diseases.12,34 Preliminary studies from Rashad and Mi (1975) and Rashad et al. (1978) on Japanese MI population showed a statistically significant increase in the frequency of whorls (35.8%) accompanied by decrease in loops compared to control groups.31,32 Since differences exist in the dermatoglyphic pattern of different population and race 35 Anderson et al., (1981) reevaluated their finding in the Caucasian population and reported that there were no significant differences in pattern types frequency among MI and controls groups of Caucasian population.12 Interestingly, we have observed higher frequency of whorl pattern in MI and lower frequency of loop pattern as compared to controls in South Indian population, marking the similar findings, thus reproducing the result of Japanese population. The similarities of the results may due to the closer Asian homogeneity compared to Caucasian population. Therefore, this finding suggests that increasing whorl pattern and decreasing loop pattern are associated with MI patients. To test this hypothesis, we calculated Odds ratio to assess whether the frequencies of whorl and loop patterns are the risk for MI. We found that more than 4 whorl patterns and less than 5 loops patterns were an indicator for risk of MI. Thus, our report impart that the frequency of whorl and loop patterns could be considered to associated with MI. Other recent studies also showed the frequency of whorl was significantly higher in patients with congenital cardiac disease, arterial disease such as aortic stenosis, aortic coarctation and Fallots tetralogy in comparison with control group.34,36 Further, Lu et al, (2015) showed a higher frequency of whorl in CAD (coronary artery disease) (53.88%) when compared to control group (45.43%).37 Hence, several studies on heart disease show increase in frequency of whorls which add to our findings that whorl pattern may be associated with MI. Further we analysed the FRC in both the hands of MI patients and control groups and found that the FRC was statistically different (p<0.05) in left hand fingers. The findings of the present study was in comparison with the earlier studies where FRC was significantly higher in congenital heart disease (p<0.05) and MI (p<0.05) than the control group.31,37,38 In the present study the left hand ATD angle was found to be wider in MI patients than control group (p=0.41), even though ATD angle was statistically insignificant, but it was in line with previous studies on congenital heart disease, Fallots tetralogy, CAD.25,37,39 Further, we found - association between A-B ridge count and MI in both right and left hands (p<0.001). Lu et al., (2015) reported that A-B ridge count of right hand was associated with CAD (p=0.01). Further, Odds ratio showed clear association with MI, A-B ridge count less than 38 is a risk for MI. Therefore, the present study on A-B ridge count on both hands indicates that it may have play role in etiology of MI. We demonstrated whorl and loop patterns are significantly different in MI cases as compared to the control group. Further, our result showed that more than 4 whorls patterns, less than 5 loop patterns and A-B ridge count less than 38 in an individual might be a risk factor for developing MI. However, dermatoglyphics cannot be a specific marker for MI, but present results suggest that finger print pattern may be helpful in screening the individuals for MI. Thus, by early intervention, the group of individuals at risk for developing heart disease can be asked to adopt a healthy lifestyle. We thank all the patients, cardiologists and nursing staff who helped us with this study. M A acknowledges the support of Yenepoya University, Nitte University and Mangalore University, Mangalore, India. The authors acknowledge Prof. Vinitha R Pai, Deputy, Director, MPhil Ph.D Program, Yenepoya University, Subramanyam K, Cardiologist, Nitte University, Prof Chakrapani M, Physician KMC, for their constant support and encouragement. We have investigated dermatoglyphic patterns among 800 participants (400 MI and 400 controls) representing South Indian population. The results showed higher frequency of whorl pattern in MI patients and loop pattern in control group (p<0.001), thus reproducing the result of Japanese population. The similarity of the result may be due to the closer Asian homogeneity. Further odds ratio suggest more than 4 whorl patterns, less than 5 loop patterns and A-B ridge count less than 38 in an individual might be a risk for MI. Therefore, the present study suggests that dermatoglyphic patterns may contribute to etiology of early prediction of MI. Cite this article : Asif M, Bhat S, Nizamuddin S, Mustak MS. Association between Myocardial Infarction and Dermatoglyphics: A Cross-Sectional Study. J Cardiovasc Disease Res. 2018; 9(1):9-14.